" Dancing With Fire is wise, integrated, life affirming, and practical. John invites us and accompanies us to discover a fully human, loving, spiritual maturity. " "Dancing With Fire brilliantly bridges the chasm between the stillness of meditation and the fierce passion and challenge of intimate relationships. John Amodeo heals the apparent rift, showing us how these are ultimately one and the same path." "A fresh and lucid voice in our emerging Western spirituality, John Amodeo offers a powerful synthesis of Buddhist teachings with attachment theory and the best of Western psychological understanding. Particularly compelling and promising is the weaving of Focusing, a body-oriented psychotherapy developed by Eugene Gendlin, with mindfulness meditation. Through this, and deep insights into the nature of relationships, Dancing with Fire gives us invaluable guidance in cultivating true intimacy with our lives." "John Amodeo opens a new door into great truths of Buddhism and what they mean for our western world. He links meditation, mindfulness, humanistic psychology and the science of human bonding into a coherent whole. This book is a great contribution and a must read for every intelligent person who aspires to live as an awake and vibrant human being." "With heartfelt kindness and down-to-earth usefulness, this book shows how to bring together lofty spiritual wisdom and juicy human passions. Drawing on his deep experience as a therapist and meditator, Dr. Amodeo has given us one of those rare books that actually bridges left and right brain, west and east, flesh and spirit - and self and other. " "Profoundly wise and beautifully written, this book is for anyone who ever wondered how to reconcile the spiritual journey with the paths of self-healing and intimacy with others. A gifted writer at the top of his form, John Amodeo's book is not just about authenticity and connection, it actually offers those experiences as one reads. A life-changing book." 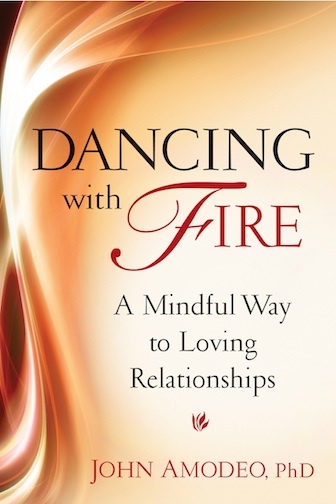 "With masterful, lucid simplicity, Dancing with Fire gives us a vision of how to make a fervent quest for spiritual freedom dovetail with an equally ardent search for love and intimate connection. Amodeo has created a founding treatise for the new, embodied wholeness so many of us yearn to find today. Yet reading it doesn't feel like listening to a sage give a lecture; it feels like you're having a conversation with a trusted friend." "Seekers of the sacred will find within these pages no ordinary wedding of East and West. Instead, John Amodeo invites us to reconcile the split between our worldly desire for intimacy and pleasure with our yearning for a robust spiritual life. His own tender voice seeps through each page--guiding us like a beacon of light toward a deeper, juicier connection with ourselves and each other, inspiring a passionate spirituality. John's best book yet!" "Liberation and awakening are about being fully human. Spiritual awakening, personal growth, fullness of relating, learning to be a more healing presence for others, fulfillment through intimacy--these are all just different names for the same thing. The fact that a split has developed--many splits, in fact--between therapy, spirituality, and personal growth is a sign that something has gone wrong. There has to be a re-integration. This book is an important landmark on the path to such wholeness." "John Amodeo has written an extremely compelling and fascinating book and one that has been long overdue. All too many people on a so-called 'spiritual path' are actually looking for more subtle and effective ways of short-circuiting the pain that is inherent in life. He clearly illuminates the lack of any contradiction between practicing mindful living and creating intimacy in one's relationships. His distinction between the extinguishing of desires and attachments and working skillfully with them is incredibly important and offers a clear path toward living life with engagement and open-heartedness." "We owe John Amodeo a debt of gratitude for providing all of us with valuable insights on the connection between mindfulness and deepening intimacy in relationships. Whether you see yourself as nurtured by spiritual practice or psychological growth, read on and your heart will be touched, your mind opened. I highly recommend this fine book as an important guide for all those who seek genuine happiness and greater awareness." "Amodeo brings what often remains lofty conversation into our kitchens and bedrooms. He shows how meditative awareness can help us develop more vital relationships while helping us embody spiritual realization more fully in everyday life. The writing style is warm and inviting, like having a conversation with a wise and gentle friend. This book is wonderful contribution to the emerging relationship yoga of the West." "A bold adaptation of Eastern spirituality to bring about loving, intimate connections." "John Amodeo's brilliantly written, incisive, and heart-centered book provides a multi-layered in-depth journey demonstrating why we need both the spiritual teachings on mindfulness along with Western approaches, like Focusing and Emotionally Focused Therapy, to truly live an awakened, embodied life of sacred intimacy within oneself, relationships, and life itself!" "Brilliant, liberating, clarifying wisdom for meditators of every persuasion! One of the most helpful books ever written on spiritual practice." People on a spiritual path yearn to connect with something larger than themselves. Along the way, there is often a subtle bypassing of feelings and longings that are uncomfortable or difficult. We move toward emotional and spiritual maturity as we uncover, welcome, and convey our deepest human feelings and tender longings. By bringing loving-kindness and a warm acceptance to whatever we're experiencing, we cultivate a spacious presence to our inner world, which makes us more available for meaningful connections with each other. This book explores relationships as a spiritual path--a vehicle for integrating our desire for intimacy, fulfillment, and joy with a robust spiritual life. Please read the endorsements below to learn more about this book. If you're interested in any of my books, you might want to consider supporting your community bookstore, but if you prefer an electronic version or want to buy it on Amazon , please click here . At midlife and beyond, we hold the extraordinary potential to become more fully awake and alive in our relationships than ever before. The author outlines the core, necessary ingredients for creating mature, loving relationships, helping people of any age to develop skills and resources to build satisfying partnerships and friendships. If you're interesed in any of my books, you might want to consider supporting you community bookstore, butif you prefer an electronic version or to buy it on Amazon , Click Here. 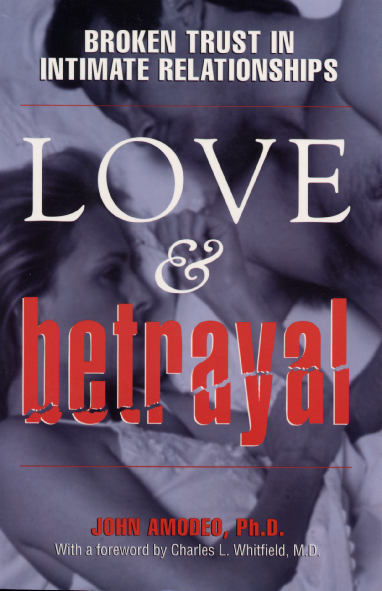 A betrayal is one of the most painful experiences we can face. This book offers a compassionate guide to healing your wounded heart and moving forward in you life. Whether you are recovering from a past or current betrayal, this book can be a comforting companion to help you understand what you're going through. There is also gentle guidance to help you learn from the experience rather than get stuck in blame, rage, or depression, as well as an exploration of how to build trust in a current or future relationship. "The best work I have seen on the authentic experience of the most difficult aspect of relationships." "A book of profound insight and wisdom, written not just for those who have been betrayed, but for anyone who wants to build deeper, more trusting relationships." "The gift of John Amodeo's book is that it gently invites the reader to participate feelingly, not just intellectually. By experiencing and understanding betrayal from a new and deeper perspective, the reader can access paths of healing and growth that are profound." "A thoughtful, useful, readable book that sensitively addresses a topic touching all of our lives. This book helps us deal with the pain, loss, and disillusionment of betrayal in a way that can lead to a renewal of ourselves and our relationships." "John Amodeo addresses the too-long-neglected matter of failed relationships. He looks at the challenges faced by men and women who want to live with more love and less fear. " "The Authentic Heart is a groundbreaking, insightful, warmly written book that I highly recommend to anyone wanting more loving, joyful relationships. John Amodeo is a thoughtful and heartfelt writer, who addresses with great clarity, wisdom, and practicality, the key steps that are necessary for building authentic, mature, loving connections - not only with others, but also with oneself." "The Authentic Heart is a fresh commentary on mature and ripened love. It brings together a wealth of knowledge, insight, and clinical experience to show that the capacity for love is not diminished by age but can be enhanced by it as we grow in wisdom. This book is not only for the middle-aged, but for those, young and old, who want to enrich their intimate relationships." "The Authentic Heart offers practical, wise, and compassionate guidance for midlife love." "Just what millions want to know--not only how to make love last, but how to make lasting love new again and again. This warm-hearted and clear-headed book is full of practical wisdom." "Full of warmth and wisdom, this book inspires us to let go of the illusions of youth, learn from the lessons life has taught us thus far and begin again with a renewed sense of humility and compassion." "The Authentic Heart makes a significant contribution to the literature on relationships." "By midlife, many people are discouraged and don't know how to begin or how to begin again. It is wonderful how John Amodeo has brought his heart to sharing so specifically and lovingly the path to this very special stage of love. The Authentic Heart is a gift of hope and encouragement." "John Amodeo is a master guide for the relationship path. His knowledge and love pour through this book on every page. With the aid of this book's grounded wisdom, we can untangle the knots of our own making, and find our way clear in any relationship of significance, no matter how challenging it might be." "If you ever have a thought of wishing you were younger, run, don't walk, to pick up this book. Open to any page and you will find the life affirming wisdom that will allow you to celebrate yourself." --Jordan Paul, Ph.D., co-author of Do I Have to Give Up Me to Be Loved by You? 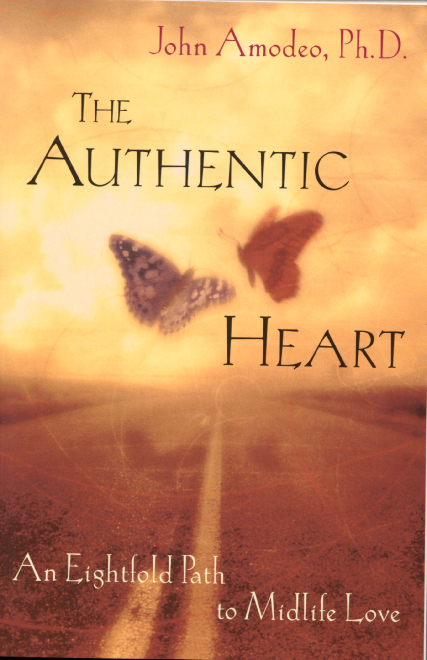 "The Authentic Heart is a beautifully written, hope-filled celebration of spiritually rich intimacy. If that's what you are seeking, you must read this book." "John Amodeo is a brilliant writer. With breathtaking clarity and simplicity, he makes the enduring truths of conscious relationships fully accessible to contemporary readers. His penetrating insights illuminate the path to deep love and intimacy." "John Amodeo is the most thoughtful writer on relationships that I know. 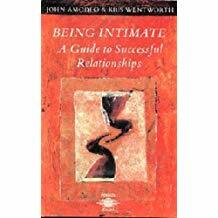 I recommend this book to anyone seeking insight and solutions to relationship issues." "If there is ever a Pulitzer Prize for a book about love, The Authentic Heart should win hands down. I have great admiration for John Amodeo's gentle, yet powerful, prose and lively writing style, and am delighted beyond words how often and beautifully he illuminates the significance of risking vulnerability and emotional honesty to achieve emotional intimacy. There are so many good examples and moving wisdom in this book. I thank him for expressing his incredibly wise experiences and insights, and I hope others appreciate the sharing of his gift as much as I do!" Intimate relationships can be the most fulfilling part of our lives. But they are often fraught with difficulty. Romantic ideals can keep us hooked into unrealistic fantasies and derail our quest for authentic love. Also, we may find it difficult to know and express our more vulnerable feelings and longings, which may lead to disconnection. By attuning tp our deepest feelings and wants and communicating them in a respectful way, we create a climate in which love and intimacy can flourish. Introducing the gentle, yet powerful process called "Focusing," developed by Dr. Eugene Gendlin, (described in detail), the authors show how we can develop connection and trust in our own felt experience, which leads to more fulfilling connections with others. "This is a sane, sound, readable, and eminently useful book. It is a carefully guided sequence of exercises, guidelines, explanations, and case examples, all thoughtfully geared to facilitate the two-fold movement of befriending self and befriending others, particularly intimates." "Being Intimate is a practical and original approach for individuals and couples that could make all the difference between happiness and painful separation." "John and Kris's book is a fine blend of the tools of modern psychotherapy and spiritual understanding. It will be helpful to those who wish to learn about these paths of growth." "This book provides a useful grid through which the reader can both look at the vast array of human stumbling blocks to intimacy and the author's helpful directions/suggestions for change." *Being Intimate is a clear and practical guide to the realization and communication or authentic feelings, and thus an excellent pathway toward lasting intimacy and love."